I am almost certain that only in Japan you’d find a coffee shop and roastery that manages to fit into 8m². Mel Coffee Roasters sets a perfect example for Japanese efficiency and perfectionism in Shinmachi, a central part of Osaka. The founders, Masa and Rie, embarked on a journey from coffee enthusiasts to coffee professionals while living abroad in Melbourne. I met the duo for a chat about the local coffee culture and their approach to roasting coffee. How did your journey to become coffee professionals begin? 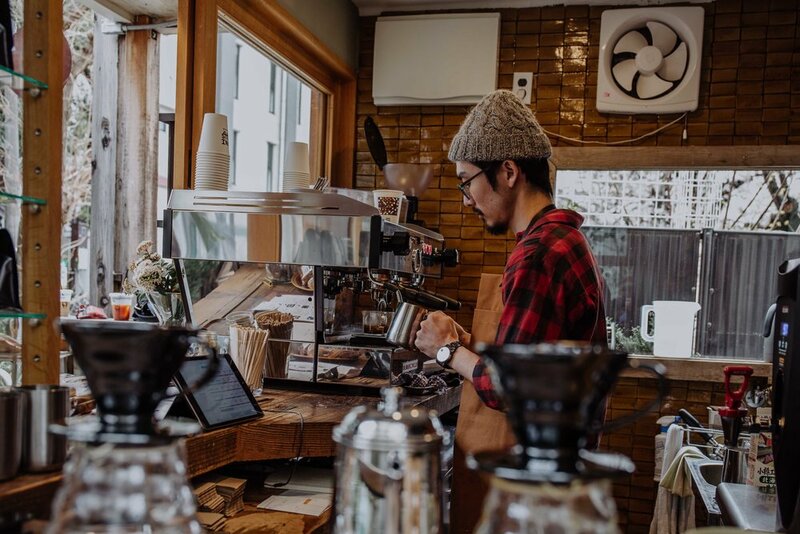 What inspired you to open a roastery in Osaka? How do people in Osaka like their coffee? Despite this development you still offer light and a medium roasts in your shop. Why? We always recommend our customers to try the super lightly roasted coffee. But as you might know, we have four seasons in the year and Japanese people appreciate each season for its unique qualities. In winter, for instance, people seek coffee that tastes like brown sugar, chocolate, cacao and nuts. To accommodate these taste preferences we prepare a medium roast for espresso based drinks that is less fruity than our lighter roasts. Check out my travel and coffee guide for Japan!